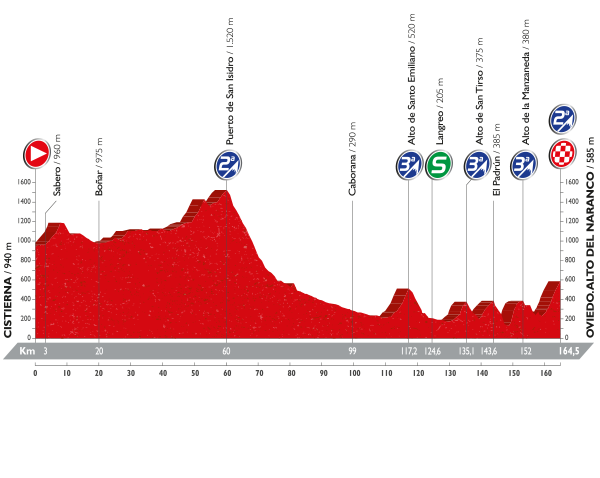 Stage 9 is a 164.5km journey from the day’s start in Cistierna to another uphill finale in the shape of Alto del Naranco, looking like the ideal terrain for another breakaway to find success at this year’s La Vuelta a España. Rising immediately from the start, the road then eases somewhat as the peloton approach the day’s relatively gently opening ascent of the Category 2 Puerto de San Isidro (11km avg 3%); after which comes a snaking descent lasting approximately 50km and placing the pack onto the foot of the Category 3 Alto de Santo Emiliano (6.2km avg 4.7%). The first in a sequence of three climbs which also features the Category 3 Alto de San Tirso (5.1km avg 3.9%) and the Category 3 Alto de la Manzaneda (3.5km avg 6.9%). By this point the peloton will have had a fair amount of climbing in their legs and will still be required to tackle the final Category 2 Alto del Naranco which forms Stage 9’s finish; the winding road to the summit lasts 5.7km and averages a 6.1% gradient throughout. Hugh Carthy has so far maintained a low profile at his first career grand tour and should be interested in contributing to the day’s breakaway action. His team Caja Rural seek to animate the race on a daily basis, though it is stage profiles like these which motivate them the greatest and are bound to have at least one representative in the day’s move. José Gonçalves provides another option for Caja Rural on Stage 9, unlucky thus far in making the key moves, though is clearly in threatening form at this year’s Vuelta a España. Gonçalves is a canny rider, dangerous as part of the day’s breakaway or a late attack from the leading pack on the final ascent of the day. Omar Fraile shall do his utmost to form part of Stage 9’s breakaway, as the Dimension Data rider is hoping to challenge for the King of The Mountains jersey at this year’s race and needs to start acquiring some points soon. His efforts during the day may nullify him somewhat by the time he reaches the Alto del Naranco, but he should be in the mix for the win regardless. Samuel Sanchez lives in the area and could well view this as an excellent opportunity to steal some glory as he nears the end of his career. Sanchez has demonstrated a level of fitness not far behind that of the general classification favourites, but will only be able to secure victory today if the breakaway is reeled in ahead of the final climb. Tejay van Garderen has swapped his normal general classification ambitions for stage victories instead, marking him out as a danger-man for all stages like these at La Vuelta. He is a superior climber to many expected to make the breakaway and would warrant the mantle of favourite within any group which reaches Alto del Naranco before the peloton. Adam Yates has already won a stage of this year’s race and there is a good chance that he may repeat this feat once again already. It will require a great deal of good fortune to set the race up in a way which could act as a springboard to victory for the British rider for a second time in this opening week though. Alberto Losada has demonstrated his strength in the breakaways at La Vuelta already and could be a good outsider on Stage 9 to take stage honours. Posted on August 27, 2016 by Spokenforks	This entry was posted in La Vuelta a España 2016, News and tagged Adam Yates, Alberto Losada, Caja Rural, Hugh Carthy, Jose Goncalves, La Vuelta a España Stage 9 Preview 2016, Omar Fraile, Samuel Sanchez, Tejay Van Garderen. Bookmark the permalink.